It was a rainy day, so we took Mik's manual wheelchair. We planned to go all the way up to Arlington House (the actual National Park), but we only got as far as the President John Fitzgerald Kennedy Gravesite before the rain began to really come down and it got to be too hard to keep pushing Mik up the steepness. This would have been much better with the power chair if only it had not been raining. 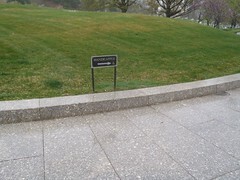 The cemetery's website notes on accessibility only mention that you can get a pass to drive your vehicle to the sites by showing your handicap placard at the visitor center. They do have a tour bus option that you can pay for to take you to the main places, but not sure if they are easily wheelchair accessible because I did not want to pay the $8.75 per person even if it was. 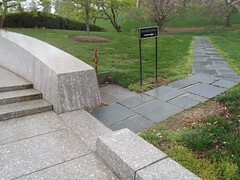 To get up to the JFK gravesite there is handicap ramp up to the right. Once you get to the top there is another smaller ramped path up to the eternal flame. There did not seem to be access to the area of the memorial with steps up to it at top of first ramp and before the stepped way up to the eternal flame. However, it really started to rain when we got up here, so did not even go and see that part myself. Overall the ramps to the gravesite and eternal flame are fine. At least grade wise they are good. The only problem was that as we came down the narrower one from the eternal flame it is not quite even with the main path. Mik's front wheels do rather stink on his manual chair compared to past ones, so even this minor unevenness meant trouble. Normally I can tilt the chair back and the little wheels off the ground, but due to the backpack and going down an incline there I had to turn the wheelchair around to get over the stupid little bump. On a good weather day I probably would not have mattered, but when it was rainy and slippery it seemed like a big thing. Even though we did not get up to the Tomb of the Unknown or Arlington House, it was worth just going to the Eternal Flame. This was Mik's first time here and he was pretty impressed seeing a flame as we got up to the gravesite and it was raining. 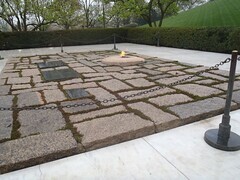 Of course, at the time he only knew we were seeing JFK's grave or I did not tell him it was called the Eternal Flame.